Blazers Kiln Dried Fuel products are made from 100% natural virgin wood, sourced from the UK and FSC approved. Also HETAS Approved, Woodsure Plus & BSL Certified. Each bag contains a £1.00 Discount Voucher for a sail on The National Trust Steam Boat Gondola at Coniston. Did you know that The Gondola Steam Boat is fuelled 100% by Blazers Fuel Logs? Blazer's Premium Wood Fuel Logs are also friendly to your pets. If they are not keen on coal spitting or cracking they will love our fuel logs as they give off no sparks or spitting. Very clean to handle unlike coal, they can also be broken much more easily than logs, and are suitable for all sizes of fireplace grates, stove fires and AGA type ovens (please check your manufacturers instructions). Blazer's Premium Wood Fuel Logs give a lovely natural flame in your open fire or wood burning stove. Less CO2 emissions due to constantly burning at a high temperature. Use of pure wood chippings free of any additives. The remaining ash can be used as a nutritious fertiliser. Included is a pack of Tigerbox safety matches. Blazers Kiln Dried Fuel products are made from 100% natural virgin wood, sourced from the UK and FSC ® approved. Also HETAS Approved, Woodsure Plus & BSL Certified. Each bag contains a £1.00 Discount Voucher for a sail on The National Trust Steam Boat Gondola at Coniston. Did you know that The Gondola Steam Boat is fuelled 100% by Blazers Fuel Logs? Less CO2 emissions due to constantly burning at a high temperature. Use of pure wood chippings free of any additives. The remaining ash can be used as a nutritious fertiliser. Included is a pack of Tigerbox safety matches. 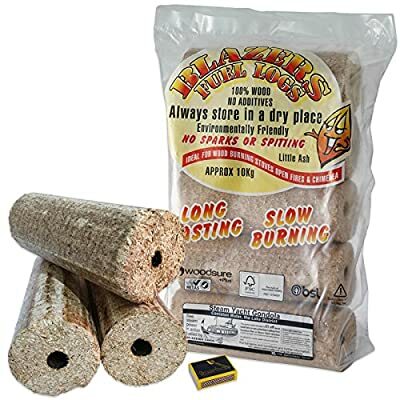 Blazer's Premium Wood Fuel Logs are also friendly to your pets. If they are not keen on coal spitting or cracking they will love our fuel logs as they give off no sparks or spitting. 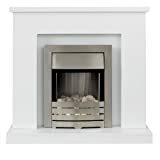 Very clean to handle unlike coal, they can also be broken much more easily than logs, and are suitable for all sizes of fireplace grates, stove fires and AGA type ovens (please check your manufacturers instructions). Blazer's Premium Wood Fuel Logs give a lovely natural flame in your open fire or wood burning stove.